-Defense Secretary Robert Gates asked for McKiernan's resignation a year before his term as commander was set to end. The firing was seen as a rejection by newly elected President Barack Obama of McKiernan's conventional warfare approach in favor of the more targeted "counterinsurgency" strategy of working to undermine insurgents' pull on the population. -McChrystal, who had a background in special operations, came in with a mandate to remake the war effort with the help of "surge" troops ordered by Obama. A year into that push, an article in Rolling Stone magazine quoted members of McChrystal's team making disparaging comments about their commander in chief and other senior administration officials. 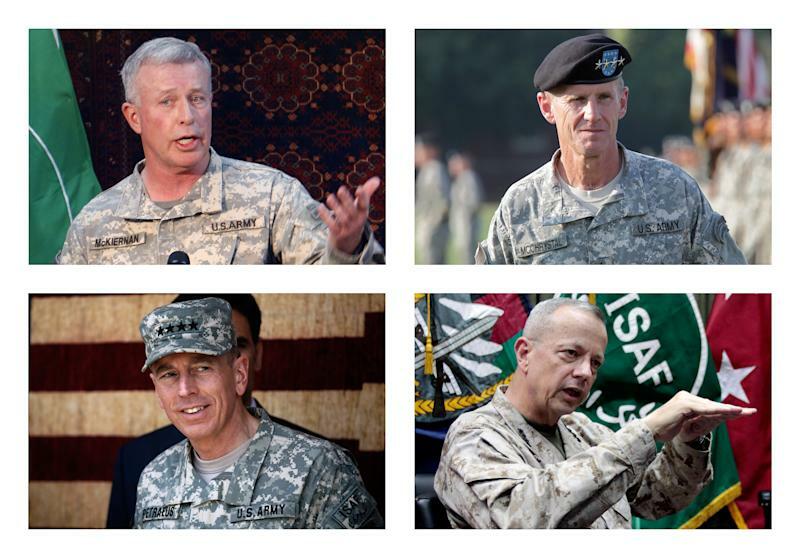 Obama called McChrystal back to Washington to explain and forced him to resign. -Petraeus took over the Afghan command to fill the void left by McChrystal's abrupt departure and agreed to serve for one year. He completed that term and then retired from the military to become CIA director in September 2011. Petraeus resigned as CIA director on Nov. 9 after he had an extramarital affair with his biographer. The affair came out as part of an FBI investigation into suspicious emails between the biographer and another woman. -Allen was appointed by Obama to oversee the drawdown of U.S. and international forces ahead of the planned transfer of security responsibility to the Afghan government in 2014. Pentagon officials said early Tuesday that Allen is under investigation for thousands of alleged "inappropriate communications" with the second woman involved in the Petraeus case, a Florida socialite. Allen's nomination to become the next commander of U.S. European Command and the commander of NATO forces in Europe has now been put on hold.